Like the Mini Cooper and Volkswagen Beetle, the Fiat 500 is a modern recreation of a classic. The current-generation Fiat 500 was introduced in Italy five years ago on the 50th anniversary of the 1957 original. More than half a million Fiat 500s of the current generation have been sold in Europe, spurred by 60 international awards, including European Car of the Year in 2008. Now, as a Chrysler product, the Fiat 500 is being made in Mexico for the North American market. In Italian, the Fiat 500 is known as the Cinquecento (chin-kweh-chento). Out of the box, it's a contender for fun-to-drive champ and as a four-seat A-class commuter car. We found it to be more fun than its competition, including Mini, Fit, Fiesta, Yaris, and Mazda2, though power is not its strong suit. The Fiat 500 is about 6 inches shorter than a Mini Cooper, costs about $4000 less, and offers safety with a 5-star crash rating, sporty performance, fuel economy, technology, cool style and good looks. It features seven airbags, a 1.4-liter engine with MultiAir valve technology, Blue&Me hands-free technology, a Bose sound system standard in many models, and a 5-speed gearbox or optional 6-speed automatic transmission that's also fun. The Fiat 500 is available as a two-door hatchback (or three-door, if you prefer) or a two-door convertible. A stretched, four-door version called the Fiat 500L is coming out early in 2013. Fiat 500 hatchbacks come in a range of trim levels: Pop, Lounge, Gucci, Sport, Turbo, and Abarth. Convertible 500c Cabrio models come in Pop and Lounge trim levels. An Abarth Cabrio is being introduced as a 2014 model. The Fiat 500 Pop is both the lowest cost and most all-around practical model. 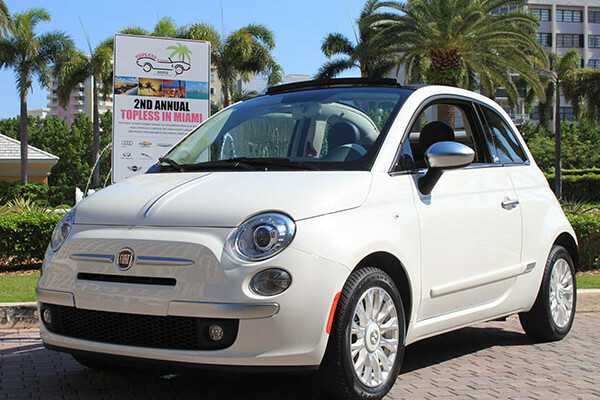 For $2000 less than the Fiat 500 Sport, the Pop is less aggressive with a better ride. The Pop makes the most sense to us, but the extra equipment in the Sport is a great value, so you're a winner either way, as long as you know what you want. You can also get the automatic transmission in the Pop. You lose some Italian flavor with the automatic, but not having to constantly work your left leg in the city, or freeway traffic jams, may be a relief. The Lounge is for those who want their Cinquecento to feel more like a mainstream car, with the automatic transmission, softened ride and steering, added chrome, more amenities, and optional leather. Unlike most convertibles, the Fiat 500c uses a retracting fabric center section of the roof, with the door frames, roof pillars and side windows exactly the same as on the Coupe models. It can be opened at speeds up to 60 mph. For enthusiasts a new Fiat 500 Turbo has been added for 2013. This slots in between a Sport and the Abarth, with many Abarth upgrades to a lesser degree: 135 horsepower, upgraded gearbox, more aggressive bodywork, bigger front brakes. The Fiat 500 Abarth model, a 500 with as much sting as the scorpion badges suggest, has been a sellout since its introduction as a 2012 model. A wholesale mechanical upgrade on the Sport, Abarth is $4500 more than a Sport and we submit worth every cent. It's the only Cinquento that has no Fiat badge anywhere and a price that does not end in 500. All the models are aptly named. It would be best to take a test ride of at least two, preferably three flavors before you buy to feel the differences. The 2013 Fiat 500 comes with a 1.4-liter engine, and it's turbocharged on the Turbo and Abarth. Fiat 500 Pop ($15,500) offers 14 colors and comes standard with air conditioning, AM/FM/CD/MP3 radio with auxiliary input, power windows, power door locks, power heated mirrors, cruise control, vehicle information display, fabric seats and 15-inch steel wheels. A 5-speed manual gearbox is standard; a 6-speed automatic ($1250) with manual shifting is optional. Pop options include a smoker's pack, engine block heater for cold climates, compact spare tire, premium or Beats audio system upgrades and sunroof ($850). Fiat 500 Sport ($17,500) comes with firmer suspension settings, tighter steering calibration, and a sharpened exhaust note. It comes with the 5-speed manual or 6-speed automatic ($1250). It's distinctively styled, with front and rear fascias with black mesh openings, slightly flared fenders, rocker panel cladding, roof spoiler over the liftgate, and 16-inch aluminum wheels. Smaller touches include chrome exhaust tip and fog lamps. Inside, the Sport features seats in what Fiat calls a Gray/Black interior environment, six-speaker sound system, leather-wrapped steering wheel with audio controls, and Blue&Me hands-free communication technology with USB port and iPod control. Sport options include the sunroof, TomTom navigation linked with Blue&Me ($400), leather ($1000), XM radio, Beats Audio, spare tire, and automatic climate control. Fiat 500 Lounge ($18,500) is the upscale model, with standard 6-speed automatic, automatic climate control, fixed glass roof, premium fabric seats, Sirius satellite radio, 15-inch aluminum wheels with wagon-wheel spokes, and more trim and chrome on the outside. It has the same softer suspension, steering, and body panels as the Pop. Lounge upgrades include luxury leather ($1500), sunroof, spare, TomTom, Beats Audio, smoker and convenience packs. A special Fiat 500 Gucci model ($23,750) is essentially a limited-edition Lounge. It uses the automatic, color-keyed wheels, green brake calipers, unique door sill plates, Gucci striping inside and out, embossed leather and plenty of chrome. Options are TomTom, smoker pack, spare and sunroof-delete. Fiat 500c Pop ($19,500) is the convertible version of the 500 Pop and equipped similarly. The 500c convertible is available in Lounge ($22,500) and Gucci ($27,750) versions. Convertible option lists match coupes, with the addition of a windscreen ($200). The Fiat 500 Turbo ($19,500) comes with a 135-hp turbocharged 1.4-liter engine, revised 5-speed manual, larger front brakes with red calipers, 120-amp alternator, 16-inch wheels, sport suspension, more aggressive bodywork and big single exhaust, black exterior light trim, and contrast-stitched sport steering wheel, seats, and shifter. Turbo options echo those for Sport. The Abarth ($22,000) has a 160-hp turbocharged 1.4-liter engine, dual exhaust outlets, faster steering, Koni FSD shocks, rear antiroll bar, 16-inch wheels, three-mode stability control, a day of professional instruction with the Abarth Driving Experience and the Turbo's 5-speed manual, alternator, bodywork, seats, brakes and so on. Abarth options are similar to Sport and Turbo, though the Abarth also offers 17-inch forged aluminum wheels with 205/40R17 tires. Safety equipment includes seven air bags, reactive head restraints, electronic stability control, and ABS with brake-force distribution, brake assist, and brake override. The Fiat 500 is the epitome of tidy design. Granted, it's easier to be tidy when there's less to deal with, and the Fiat is so small there isn't much. There's a chrome strip on the nose, like a pencil-thin moustache, that the Cinquecento's designer added because without it, he said, the car's styling was too perfect. Rarely does any manufacturer understand what clean really means, but Italians do. For that reason alone we need them back in America, as a good influence. The face of the Fiat 500, with round halogen projector headlamps and parking lights, combines the family resemblance of other Fiat models sold in Italy, with a modern interpretation of the original Cinquecento, imported to the U.S. as a 600cc model back in the 1960s. No one in North America remembers, of course; but no matter. It's a winning European design that's been brought to America after a gentle massage to meet U.S. lighting and bumper standards. Simplicity and strength are conveyed thanks to very short overhangs and muscular fenders, with the front fascia tapering outward to larger wheel arches on the Sport. On the Sport there's a horizontal cooling duct of black mesh that adds racy character, while the lower mesh grille integrates fog lamps. The hatch spoiler is a must for aesthetics and helpful for economy, rear-seat shade and Italian-speed stability. The distinctiveness of the Fiat 500's shape appears from the profile view, more than front or rear. The black window outline on the Sport enhances the good looks of the all-business roofline, while the chrome on the Lounge, especially those chrome mirrors and door handles, detracts from or makes it pop depending on your view. The Sport also has rocker-panel cladding that isn't bad, as rocker-panel cladding goes. The rear view is stylized by a chrome license-plate brow, common in cars today, but true to the original Cinquecento that was inspired by a bicycle seat, believe it or not. The rear tail lamps are located between the edges of the liftgate and follow the door's vertical cutline. For a contemporary look, the rear glass spans the width of the liftgate and meets cleanly at the pillar. The Lounge has a chrome rear bumper that adds a touch from the '50s. Also, we might add that the coefficient of drag is 0.35, which is darn good for a little box of a car. The original Fiat 500 had a canvas roof that's legendary, and today's Fiat 500 features an optional dark glass roof that copies the style. The optional sunroof is available as fixed or powered; in either case the shade is a semi-opaque fabric affair so check it in bright sun if you're not solar-powered. There are five separate wheel designs of 15 or 16 inches, with at least three of them good-looking and eye-catching, and many vivid colors to choose from. Fiat 500 Turbo and Abarth models look like a Sport on steroids, with deeper airflow-shaping devices at both ends making the car a couple of inches longer. Larger wheels are punctuated by big front brakes but the bigger, forged 17s really should be standard on Abarth, and the big exhaust barrels wouldn't be out of place on a hot rod. Brightly colored mirrors and Abarth racing stripes are available. Only four colors are offered for Abarth, while Turbos offer seven colors and no wallpaper. Abarth carries plenty of scorpion badges (Carlo Abarth was a scorpio), some with Italian-colors lightning bolts behind them, but the Abarth does not say Fiat anywhere on it. If the exterior is the epitome of tidy, the interior is the epitome of neat. As Roberto Giolito, the head of Fiat Style says, it delivers absolutely everything that is required and nothing more. Unlike, say, an overly cute Mini and too-boring Yaris. The Fiat 500 instrument panel gives the Fiat the visual feel of a sports car, except for its one flaw: a three-ring circus for instrumentation. The tachometer and speedometer are concentric and this takes some fun out of driving and shifting through the gears, in particular with the Sport, because it ought to have a tach of its own. The tachometer ring is inside the speedo ring, and almost all of the space inside the ring is taken up by LCD information. So all that's left is the tip of a tach needle moving around a chrome ring against small white numbers that are hard to read, especially past 6000 where the numbers are red. And the stub of the speedometer needle, with all its numbers to 140 mph, moves around outside that. It's almost as confusing to the eye as it is to the brain to read about here. Also, if the Fiat were as simple as they say it is, the radio would have dials for volume and tuning, not buttons that you have to hold your finger on and take your eye off the road to watch the digital number tick along. Everything else is real good, especially the metal instrument panel painted the same color as the car. And the seats, all four upholsteries, are really great. Standard cloth, premium cloth, sport cloth. It may be referred to as cloth, but it doesn't look like cloth. They're all different fabrics, all satisfying, as much like leather as cloth can feel. There's also optional premium leather, but the other seats are so sharp that leather isn't missed. And the fit is mostly right, although other reviews have complained that there's not enough bolstering in the Sport seats; the Abarth is better in this respect and where 500 seats mightn't be as heavily bolstered as some they do have generous padding others don't. The steering wheel tilts to adjust but does not telescope, a feature many wish for and one the arch-enemy Mini does better because it has both. We found front legroom adequate: One 6-foot, 6-inch driver said he fit okay in the 500, but your inside knee will be nestled against the relatively hard console side. The top of the dash is vinyl and its design as simple as it gets: it's just there, and doesn't try to be anything, like for example the new Focus that tries to be a cockpit surrounding the driver. There are good armrests for both of the driver's elbows when holding the perfectly sized leather-wrapped steering wheel at 9 and 3 o'clock. The Sport shift knob is about as big and round and chrome as you can get away with. Doors cleverly lock with an inward push of the handles. And it's a little car with big long deep door pockets, how about that. The climate and audio systems and vents are in the center over the console, but it's not exactly a center stack, it's less than that, while still being complete. The shift lever, whether manual stick or automatic, rises from the bottom of the dash, a forward place where it's a more natural reach and less-often fouled by passenger limbs. Legroom in the rear is 31.7 inches, which is not much; we barely squeezed our briefcase behind the driver's seat. However, with the front seats slid forward, the rear legroom is not half-bad, but that's because the rear seat is a bench, so passengers sit upright. Fiat says it's roomy for two adults, and we wonder what species they mean, certainly not two adult humans. Young people running around town might not mind the squeeze, nor the climb into or out of the rear seat. With the rear seats up, you might be able to get a pair of soft-side carry-on bags in the back. Drop the seats and it's a little hatchback with lots of room to throw small stuff in, through the liftgate. The glass roof in the Lounge not only makes the interior feel more airy, it raises the ceiling, over the headliner or optional sunroof; the sunshades have been darkened for 2013. There are three cupholders in front and two in back, and the glovebox is ample. Navigation is optional, a plug-in-dash unit you can take with you for security. It works with the Blue&Me hands-free communication that's standard on all but Pop. Each of the Fiat 500 models is quite different in the way it drives. And the Turbo and Abarth are different breeds altogether. Let's start with the Fiat 500 Sport, which is truly sporty, with a firm ride, thanks to stiffer springs and shock tuning, firmer brakes, and quicker steering. It all adds up to a wonderfully responsive car, although the ride isn't as relaxing as the Pop or Lounge models, especially over bumpy roads or in the city. But if play is what you like, you'll have a blast in the Sport. The 5-speed gearbox uses a cable linkage between shifter and transmission, which gives it a ropey feel reminiscent of Volkswagens. We found it a bit clunky, not that much fun to shift. The clutch is light, with a long throw. It works, however. We never missed, never fumbled, and always got the heel-and-toe downshifts. The Sport's red brake calipers can be seen through the 16-inch wheels in a color called Carbide and team with firmer suspension and larger, stickier tires for good brake performance. Brakes are the same size but stopping in the Sport is significantly more responsive than in the Pop and Lounge (due to tires and suspension), which is good when you're driving in a sporty manner, but it requires a soft touch around town. The Pop and Lounge do that soft touch for you. With 10.1-inch front and 9.4-inch rear rotors, and so little weight to bring down, getting stopped in time is never a worry in any of the models. The 6-speed automatic transmission is available even on the Sport, and it is a transmission you can play with. The lever location is the same in the automatic as it is in the manual (although the knob isn't), so it feels like a stick shift. The Lounge comes standard with the automatic, and the Pop works well with it, as a compromise. There's a Sport mode for the automatic transmission that sharpens and delays the shifts nicely, without too much override, so you'll still have a sporty little car. While the automatic exacts a 10 percent penalty in EPA ratings, the real-world difference isn't that great, and acceleration performance isn't seriously hampered because the automatic has shorter gearing than the manual. In the Lounge, the first thing you notice is how much looser and easier the steering is, then the same with the ride, and the brakes. In the city, this is good. The more relaxed steering makes the whole car feel a bit bigger, but the fixed glass roof in the Lounge has something to do with that, too. The Fiat 500's 1.4-liter engine features a reinvention of the cylinder head called MultiAir technology, which results in an impressive 101 horsepower and 98 foot-pounds of torque. MultiAir is a complex system that drives the intake valves by oil pressure actuators, triggered by electronic control: It's truly continuously variable valve timing. One big downside is that Premium fuel is recommended but 87-octane Regular unleaded is acceptable, according to Fiat. EPA estimates 31/40 mpg City/Highway with the manual, but it might be better than that; we got 34.2 miles per gallon, revving it high and running it hard. On level highway cruising the numbers typically ran in the low 40s. Automatics are government-rated 27/34 mpg, and turbos are 28/34 mpg. We've driven all the 500s, including Abarth and convertibles over winding California mountain roads, closed courses and crowded urban centers. We found enough acceleration to work with when passing on two-lane roads in Sport mode. Manually shifting gears to stay in the powerband makes it fun on winding roads. It's a momentum machine. There is little torque at low rpm. (Torque is that force that propels you from intersections and up hills.) The power comes on at a relatively high 4000 rpm and redlines at 6800, a point that's unfortunately hard to judge because of the difficulty of reading the tachometer, especially the red numbers and lines over 6000 rpm. At least the rev limiter cuts fuel gently; the engine just flattens at 6800, it doesn't nose-dive. Even at this point, there isn't a lot of horsepower. The second- and third-gear ratios are far apart, so in some situations you're either revving high in second gear or lugging in third gear. One treat is that the engine feels like it's ready to shift at 5000 rpm, and it certainly can be shifted there and still maintain momentum, but it just keeps putting out for another 2000 rpm, pleasantly surprising you. Another pleasing aspect is that 80 mph in 5th gear is only 3300 rpm, and on level ground it glides fairly effortlessly at that speed. Ninety miles per hour in 4th gear is still only 5000 rpm. Do the math and that's a theoretical top speed of 153 mph in 4th gear; fat chance, but the sweet engine fools you into thinking it might just be capable. And it's reasonably quiet too, thanks to hydraulic engine mounts and extra sound deadening material. The Turbo and Abarth are different animals, as every mechanical component is upgraded: engine, drivetrain, brakes, suspension, and electrics. Fitted with a turbocharger, dual air-to-air intercoolers and pistons that enable a slightly lower compression ratio, a Fiat 500 Turbo generates 135 hp and 150 pound-feet of torque, a 50-percent torque gain on the base car. That drops 0-60 mph acceleration time from the lethargic 10-second range to mid-8s and makes it a much more flexible engine around town that needn't be revved much. With the same brakes and bodywork you can think of this as a light-pressure Abarth, a nice mid-point between a Sport and the lunatic Abarth. The Abarth turbo pushes air into the engine at up to 18 psi. That allows 160 horsepower and 170 pound-feet of torque, both at much lower revs than the 500, so the Abarth is not only substantially quicker it's also more relaxed, pushing full-steam by 3000 rpm rather than 6000. All that midrange torque means you play with the shifter as much for audio as for propulsion. The Abarth model is quick only compared to a Fiat 500, a Smart car or other slow econoboxes. Still, 0-60 mph in about 7 seconds is plenty brisk and the Abarth can still do 25-35 mpg in daily driving. Alas, the blat and blare from the exhaust is loud like a piston-engine airplane and intoxicating, enough that onlookers often turn looking for a motorcycle. It's fun at times, but could wear for some owners. The Abarth's 5-speed manual gearbox is stronger and has a tighter shifter than the standard Fiat 500. It's an improvement, but it is not on par with the best. No automatic is offered for Turbo or Abarth. Front brakes are larger and do everything the Sport's do, only better. Sixteen-inch wheels are standard but unless you have really bad roads, the Abarth's forged 17-inch alloy and Pirelli combo should be factored in to your budget. With an added rear antiroll bar and Koni FSD shocks not used on the Turbo, the Abarth changes direction quickly, rotates nicely off-throttle (for sharper response when turning into a tight corner) and offers good grip. It's very nimble, fun to drive and the relatively high seating position and 12-foot length make child's play of urban traffic. Both downsides are related to the relatively fat, low-profile tires: Those downsides are a busy ride on marginal road surfaces and the need for 38 feet of road for a U-turn, a full 7 feet more than a standard 500 and comparable to that of a midsize sedan. To ensure full Abarth thrills, the electronic stability control system offers three modes, including full-off. An Abarth purchase includes a day of professional instruction with the Abarth Driving Experience, and we highly recommend that because it's fun. The Fiat 500 is a tiny, high-mileage, low-cost, four-seat car that has the style and performance of an Italian car, with a five-star crash rating from the government. It's 6 inches shorter than a comparable Mini and about $4000 less expensive, be it coupe, convertible, Turbo or Abarth, while bringing a fun-factor that similar Asian cars can't match. Sam Moses drove Pop, Sport and Lounge Cinquecento models near San Diego; G.R. Whale drove coupe, convertible, Gucci and Abarths in central California and in Michigan. Head/hip/leg room, f: 38.9/47.9/40.7 in. Head/hip/leg room, r: 35.6/42.6/31.7 in. Cargo volume: 30.2 cu. ft.